So that’s the reason why John and I decided to leave our house. We packed our bags and drove the starex towards Kidapawan. Me being me, I researched online about the place. Sad to say though, there isn’t much news about it. Or about its resorts, for that matter. What I found was Lake Agco Resort. It’s supposedly at the foot of Mt. Apo and can be reached by any vehicle. Meaning, no walking for me. Yay! So off we went to Kidapawan. You’d think it’s scary since you know, Mindanao is not safe. According to the news, that is. 🙂 But then again, not everything you see on tv or read in the news is true. The reason why I stopped reading or watching one is that “there is no good news”. Parang nakakasawa na ano? Puro bad news na lang… Hay naku! I always love road trips. But this one is different. We had no maps. And we’re not familiar with Kidapawan. We just relied on the goodness of our “kababayans”. Kidapawan is just a 3 hour drive from Davao City. If you’re driving fast, you can do it in 2 hours. But with me around, you can’t do that. John calls me “lola” because I prefer a slow drive. That way, I can take pictures and enjoy the scenery. The view from Davao to Digos is beautiful. If you see the sugarcane plantation with the mountains as a backdrop, you will understand what I’m talking about. And then the rubber farm in Makilala, with the trees so tall and the cool temperature , it makes travelling more enjoyable. Finally we saw the big “Welcome To Kidapawan” sign. And this is where the fun begins. I mentioned earlier that we had no maps right? So we started asking for directions. The first person we talked to said, turn right beside the church. And follow that road. Then ask again when you see more people. Uh-huh?! What exactly does that mean, I thought. After we said thank you, we followed his direction. We were driving in an unfamiliar (but with a beautiful view), road. It felt eerie at first because the place was so quiet and there were no people. Or so I thought. And then here comes the crowd. Well, when you’re in the Philippines, you’d see people everywhere even if you’re in the middle of the forest. 🙂 What was I thinking! Ok, so we asked again. The boy pointed us towards the mountain, using his lips. We were glad that we’re on the right track. 🙂 After several kilometers of rough and rocky road, (sounded like an ice cream huh?! haha…) , we still have no idea where we are. So we asked again, the man said 3 more kilometers. I thought, finally! Well we passed by 3 kms more and this resort was still nowhere to be found. I am so glad we continued with our trip because the view was breath taking. I cannot show you the pictures though because it was part of those I lost. It felt like I lost a part of my life when our hard drive crashed. A lot of beautiful memories, gone forever.. 😦 Thank God, I am not that old yet. I can still remember some of the details. That’s why I’m making a chronicle of our travels now incase I get amnesia someday. he he.. So up we went. The air became thinner. The forest was covered with thick fog. I was so amazed with the nipa houses I saw on the hills. I wondered what’s their mode of transportation going to the main road? Or do the locals just walk? If so, that’s like hours of walking.. Tsk.. tsk.. Or do they have horses? I’m sure they do.. Maybe? I don’t know.. This is the only photo I can share with you. I borrowed it from the ones I submitted through ImagesPhilippines. I am so glad that they kept it. Thank you Images Philippines for keeping my picture. We wanted to get away from the noise for several days but I guess it wasn’t meant to be. The trip, tiring it may be, was a blast! It was our first time to be near Mt.Apo, the tallest mountain in the Philippines. That alone was an experience to remember. Not to mention the adventure to the unknown. 🙂 And the fun of asking people for directions.. Ahh.. it was all worth it! 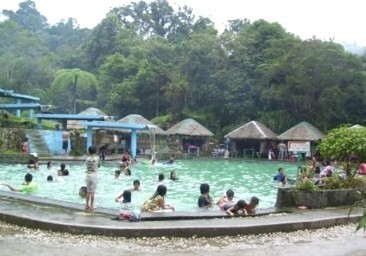 This entry was posted in My Travels, Uncategorized and tagged Kidapawan, Lake Agco Resort, Mt. Apo, road trip. Bookmark the permalink. UPDATE: I talked to a client of mine who works at PNOC about putting up a signage from Kidapawan to Lake Agco Resort. He said that he's happy I told him what I thought because their thrust now is to promote Lake Agco more as a tourist destination of Kidapawan in coordination with the local government. 🙂 I am so happy! I promised him that when they're done, I'll go back there so I can blog about it… Thank you Mr. Malong for listening to my suggestions. Hopefully we will be able to promote Mindanao more!